News Flash - read about Holley Gene's new book, "Re-creating Biblical Clothing"
for re-enactors and costumers. Featuring costumes of over 30 Biblical characters. available from Amazon.com in paperback. 'Adoration of the Christ Child' - Tom Browning painted this beautiful mural for the re-dedication of St. Mary's Catholic Church in Boise, Idaho. I made the costumes for his models to wear. The lavender-colored chiton below was for Lydia (see mural, far right). The brown tunic and overdress was for Ruth (center mural panel, seated at left). I often portray Lydia myself (see below, right). To learn more about Tom and the mural, go to www.tombrowning.com. Click on 'ART', then on 'ST. MARY'S MURAL'. are available at discounted prices ! 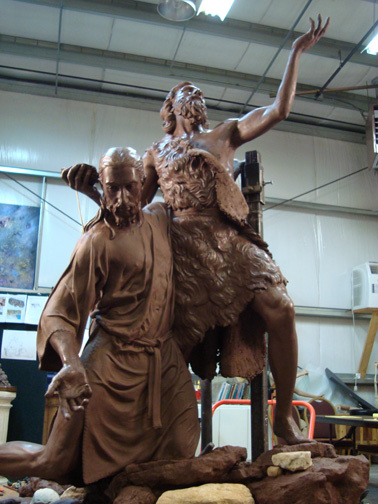 'John Baptising Christ' - I also made costumes for the bronze sculptor, Rip Caswell. His preliminary sketch and clay sculpture are shown below. To learn more about Rip and his work, go to www.ripcaswell.com. I can create a 'wardrobe' for you by making a flexible outfit that will span several decades. I enjoy creating reproductions of vintage clothing from old drawings or photos. I also offer Biblical clothing representative of various regions and eras of the Bible. Some of my fashions are available in kit form, cut-out and ready to sew. I also offer patterns of my own. I am available to give fashion shows and presentations to your organization on clothing of 'La Belle Epoch' (1890-1914) or clothing worn by Women of the Bible. I can also give hat-making workshops and critique clothing for your organization or events. It's fun to wear a costume that is part of our heritage and honors the past. I look forward to creating something for you. Holley Gene is costumer for the Murphy Auto Museum in Oxnard, CA - the only classic auto and vintage clothing museum in the USA. See 50 classic automobiles and vintage clothing from the 1900s thru the 1970s. Regular hours for the museum are Saturdays and Sundays, 10 am to 4 pm - admission: $6/$3. See the museum website for further information. Holley Gene is costumer for the Women's Spiritual Repertory Company (WSRC), an organization of individuals and groups of women dedicated to learning and teaching others about the women of the Bible, their lives and stories. Contact WSRC through their website www.biblewomen.net if you are interested in further information. Holley Gene is costumer for the Leonis Adobe Museum. Miguel Leonis, one of the most colorful of the early land settlers and pioneers of Los Angeles, became the third richest man in California. His home and headquarters was the Leonis Adobe located in Calabasas at the west end of the San Fernando Valley. Now a museum, it is open to the public. Click here to see a photo of Angela Shwanz, Leonis Adobe General Manager, wearing an 1880s bustle dress. Click here to go to the Leonis Adobe website. Holley Gene has given several presentations to the docents about turn-of-the-century costumes appropriate for the historical buildings of Heritage Square. Click here to go to the Heritage Square website. 2003 was the 100th anniversary of my grandfather's trip across America in a 1903 Curved Dash Oldsmobile! My grandfather, Eugene Irish Hammond, and his companion, Lester L. Whitman, were the first to drive all the way across the USA (from California to Maine - two earlier auto trips by others ended in New York). My family's 1903 Olds is now on display at the Murphy Auto Museum in Oxnard (Calif). Click here to see my family's 1903 Olds. I have a PowerPoint video presentation about my grandfather's trip across America in 1903. The presentation has 100+ photos taken during the 1903 trip and from a re-creation of the trip I went on in 1985. Contact me if your organization would be interested in my presentation. My family's 1903 Curved Dash Olds can also be transported to your event within a reasonable distance from Ventura. Holley Gene was selected as Costumer for the 1910 Ventura Exposition, and the 1913 Yesteryear Festival benefiting the Ventura County (California) Museum of History and Art. These events were held at Ventura's historic Pierpont Inn. Ventura's Architectural Weekends feature tours of Ventura's historic downtown and midtown homes spanning 1880 - 1930s. A special feature is the only Greene & Greene home built in Ventura - the Gould Home - in Midtown. If you like historical buildings, you will NOT want to miss these events. Video about Ventura Architectura Weekend courtesy of Peter Kuehn. with black powder cannon and 21-gun salute.